A comparison between an incumbent pump system and ETM pump system. Electric Torque Machines (ETM) says that its motors have a 30% lower cost, 70% smaller size and 50% lower energy consumption, and have been changing the motor landscape in other applications for years. 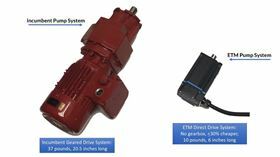 The company also reports that similar results have been validated when ETM’s patented M-Series direct drive motor is coupled with positive displacement pumps. ETM claims that its patented motor technology delivers 5x to 10x higher continuous torque at low rotational speeds, completely eliminating the need for a gearbox and its associated bulk, cost and maintenance. Electric Torque Machines (ETM) M-Series direct drive motor cost and operational advantages have been validated for driving peristaltic pumps.